The Rieth family's sweet corn, before being processed into succotash. Let’s talk for a moment about succotash. It means “boiled whole kernels of corn” in Narragansett, an Algonquin Native American tribe and language from the Rhode Island area. Succotash has come to refer to — at least in my neck of the woods — a combination of sweet corn and fresh beans, usually the (in)famous lima. From an early age, I was exposed to two different types of succotash. The first type made a regular appearance on my school lunch tray, and if the rest of my fellow third-graders followed my lead, it also made a regular appearance in the lunch-room trash cans. Ignorant as we were of the problem of food waste, the over-boiled “green” beans and whole-kernel sweet corn simply couldn’t compete with the smooth, ground-up, breaded chicken patties and french fries that served as succotash’s neighbors on my plastic blue lunch tray. The second type of succotash I was exposed to was my mother’s, and despite sharing the same name as that conglomeration of vegetables I was served in my youth, the similarities stop there. The lima beans and sweet corn in my mother’s succotash came from our roadside garden where they were fertilized with the manure of last year’s beef steer and blessed with the diesel fumes and country tunes of passing pickup trucks. 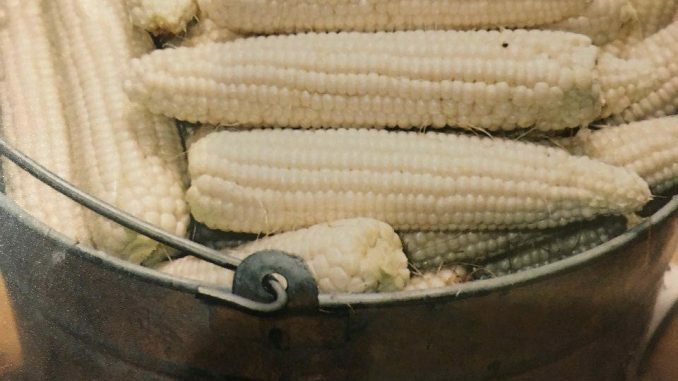 As a child, I can’t say I particularly enjoyed shucking those ears of sweet corn or splitting open the lima bean pods, but I certainly enjoyed eating the beans and corn covered in butter. So, shuck and split I would, however grudgingly. I don’t make such a differentiation between the succotash of school lunches and the succotash of my childhood household because I wish to ridicule the school lunch system. A school lunch worker has an enormous and stressful job deserving of the utmost respect. I make this distinction because I think that good succotash is one of the easiest things to produce for oneself. Sweet corn is one of the few vegetables that can still be found locally and in relative abundance. There are two roadside stands selling sweet corn south of Albion (on Albion Road) and at least one north of Albion on M-99. You could also find a few ears at the Albion Farmer’s Market (on Wednesday afternoons and Saturday mornings) or the Jolly Green Junction on the eastern side of M-99, north of I-94. Last I checked, these stands were selling sweet corn for around $3 a dozen. Lima beans. Photo via Wikimedia Commons. Lima beans, on the other hand, are not quite as ubiquitous, but they are out there. In fact, last week at Ann Arbor’s farmer’s market, I scored a peck of them for $5. You can also use any type of fresh shelling bean you can get your hands on for succotash, whether that be a cranberry bean, dragon’s tongue bean or overgrown green bean. Succotash can be served as a main dish accompanied by other late-summer fare — perhaps a nice zucchini-ricotta galette — or as a side dish to go with a grill full of steaks. The great thing about succotash — and likely the reason it made such a regular appearance on my lunch tray — is that it can be frozen and reconstituted to a dish that is just as tasty in winter as in summer months. What follows are my guiding principles for making the succotash that I grew up with. I hesitate to say “recipe,” since such a term refers to a set of instructions and ratios that usually has success as an implication, and I can hardly promise such a result. As with most foods that I’ve come to engrain in my culinary habit, these are merely cooking suggestions, and as such they can be augmented to fit your own culinary tastes. Sweet corn: Plan on two ears per person. Your dinner guests may claim that they will only eat one ear’s worth, but in my experience the combination of butter, salt and corn-bound sugar makes a second ears-worth almost impossible to resist. Lima Beans: One pint, unshelled, per person. The pods should still be green, but not necessarily tender. The beans inside should be a vibrant green and one or two centimeters in diameter. Butter: Obviously. But in a pinch, any cooking fat will work. Olive oil works just fine. Shuck the corn. Expect to be mildly frustrated by the corn silk sticking to your clothing, and accept the fact that you won’t get all of the silk off each ear. Place the shucked ears into a pot of boiling water. Boil for three minutes. Drain the pot and leave the ears of corn to cool for a few minutes. In the meantime, enlist the help of your friends, neighbors, children and whoever else is around to help you pluck the lima beans out of their pods. Rinse the beans to rid them of any dirt, hair, bugs or pod-popping-wrought frustration, and boil them in a generous amount of water for 15 minutes or until tender. While your beans are cooking, cut the corn kernels from the cob and add the kernels to a mid-sized bowl, pot or hubcap to a mid-sized sedan. If you happen to be making this dish in your apartment at Albion College, I would imagine Residential Life would appreciate it if you didn’t try and put the corn cob through the garbage disposal (though, I admit, I would love to hear what type of sound that would make). When the beans have finished cooking, drain them and add the lima beans to your bowl of corn. Douse with more butter than you think necessary and a hefty pinch of salt. If you pushed me for exact amounts, I would say probably twice as much butter and salt as your cardiologist would tell you is safe. If you’re planning on freezing your succotash, there are a few subtle differences in boiling times you may want to observe: Boil the corn for only one minute and the limas for only three minutes before packing them cozily into pint or quart-sized freezer containers for a mid-winter delicacy. Omit the butter and salt until you defrost and reheat. Feature photo by Evan Rieth.